I awake as it begins to lighten up. This is getting later and later everyday as the summer begins to wane and the daylight hours grow less and less. Fall is coming, fall when I intend to be home, fall when the snow comes to Washington and Canada. I'll be long gone from here, from this trail, from this minimalist lifestyle. Back to eating normal sized meals in normal ways. No longer boiling water over an alcohol fueled stove. No longer living in a tent. All these thoughts run through my mind as I sit in the semi-darkness slowly munching my granola. I slow down and savor the moment. I'm healthy, I'm in awesome shape. I have the metabolism of a teenager and can eat without getting that grown-up bloated feeling. I can walk twenty five miles in a day without difficulty. I am really grateful that I've had this opportunity to pursue this goal. At this point I don't see myself ever doing this again. This is a young person’s dream, to me it's a goal, once reached, it's time to move on. I drink my coffee and sort my snacks. Today's the day I have the opportunity to gain a day on my schedule by reaching Cascade Locks today instead of tomorrow. I'll talk to the motel and see if I can change my reservation to today rather than tomorrow. Then I'll visit PCT Days and see what that's all about. I pack quickly and precisely everything goes in the exact spot it always goes. I pack everything in the same order every time too. Methodical and consistent, it allows me to know I have everything without having to inventory everything. Out of the tent and off to the trail. I pass the other tents that were here when I got here. No one's up yet. I turn north on to the PCT and begin hiking. The trail follows the tops of the ridges here. I'm in the sun then I cross over to the shady side, staying really close to the top. Part of the ridge are ten feet wide at the top with steep slopes down each side, way down, way way down. Perhaps thirty five hundred feet. I look north and see Mt Rainer floating on the haze to the north. It floats between Mt Adams to the east and Mt Saint Helens to the west. Three massive, impressive volcanoes. Mt Saint Helens has a jagged top. I remember when it blew it's top. When it smoked and fumed and spread a cloud of ash for thousands of miles. Now it once again sits there dormant, quiet, just another quiet mountain for weekenders to climb. Somewhere buried deep beneath the mud and rocks that blew that day are the remains of the hermit guy who refused to leave Spirit Lake. The Lake is also buried under hundreds of feet of rock and mud. I think about all the lava and flows I've crossed and wonder what else lies buried beneath the trail I've been walking on. The ridges continue at pretty much the same elevation for miles and miles. Hours later I arrive at Indian Springs. This is where I leave the PCT to take the Eagle Creek Alternate. I stop at a lone picnic table where Tobias a section hiker from Germany is making a massive salami, cheese, peanut butter tortilla. I leave my pack and get some water from the spring. Returning, I plop down at the table. Cowboy Jim and another hiker are sitting there too. We sit and munch our various snacks. I'm having a simple peanut butter tortilla with an apple smoked bacon jerky side. The sun is warm here at four thousand feet of elevation. I wonder how much warmer it'll be down below. I leave the others and head down the alternate. I notice immediately that this is not the same trail as the PCT. It's steeper, narrower, sideways, and rocky. The switchbacks are sharp and short. It winds seemingly randomly across the nose of a ridge. Down steeply the whole way. This is the Indian Springs trail connector to the Eagle Creek trail. I don't think any time has been spent engineering or maintaining it. On it goes, lower and lower, over logs, under low hanging branches. Then it suddenly tees into the Eagle Creek trail. I stand there in the intersection not fully sure of which way to go. It seems to be going downhill to the left, that must be the way. I consult the map. Feeling more confident I head left down the hill. This trail is more PCT like. Wider and flatter. Consistently downhill, graded the same. I pass hikers heading up. The trail hugs the side of the slope, almost cliff. Very steep and very long way to the bottom. I come up on a guy holding his hat in such a way to block his view down. His friend in front stops and tell him I'm behind him. He faces the uphill slope and lays against it looking intently at the various plants. “I have an issue with heights,” he explains. “This is good for you,” I said. Like I know whether it's good or not. I meant to say something to the effect of “its good to see your confronting your fear.” But it came out wrong. Again I don't know if it's good or not. All I know is that he has miles and miles of this to hike down. At the speed he's going he's going to be hiking for days. How good is that? I think ‘good’ might be the wrong word. I have lots of time to think about this as I head down. The trail continues on and on. Always down. Winding around the edge of the ridge. The trees are thick and dense. I don't see much but the trunks of trees that are growing from the somewhere down below and whose tops disappear into the branches above. No sound of water, no sound at all except the occasional squawks of birds. Sometimes I see through the trees to the other side of the canyon it looks like how I imagine this side looks from there. Thick with trees. The difference is that it's in the sun while this side is shady and relatively cooler. I eventually travel low enough to see the first cascades of a creek coming down the hill from the left, crossing the trail and continuing down to the right. It's got a happy clear note in its bouncing flight downhill. Multiple little falls are interspersed with a happy little creek flowing through ferns and other water friendly plants. It's like a moving postcard. It's so long it's impossible to take a photo of it. I would only be able to capture a part of it. I can't see the part that would capture the essence of the whole. I give up, taking no picture. Just soaking in the beauty of the location. It's park like. This is what landscape designers strive to capture in their creations. This place just is, here it sits miles and miles from anywhere. No easy way to get here. My entire hike down the alternate has been reimbursed in this single view. I could stand here for hours soaking it all in. In reality I stand there for less than fifteen seconds. I hike on disappointed in my inability to capture the view in pictures. It isn't long before more amazing sights greet my eyes as the trail becomes a series of fantastic and surreal waterfalls and water features. The trail however decides there is a price to pay for beauty. It turns rocky and hard. Pointy edges of rocks embedded in the trail make it impossible to walk without my feet hurting. The trail is brutal inflicting as much punishment on my feet as possible. I stop often. The views are so wonderful and surprising that I want to laugh and cheer out loud. I want to clap and congratulate the designer. Which I do. If I were an artist this would be my inspiration. There is enough inspiration in this place to last several lifetimes. The trail is hacked out of solid rock. It's the antithesis of the views. The further down I travel the more people I see. It's the weekend. It's a warm sunny weekend. This is Oregon. Most people here live without air conditioning. It's somewhat understandable that they'd come. But it's at least six miles from their vehicles parked at the trailhead. The trail is difficult. It's a walk of hours in the heat. Then they have to walk back out. By now it's late in the day and they are still walking in. I am amazed at their dedication. I don't know if I would do it for a day hike. At least now that I know what it takes. Maybe they start without fully grasping the difficulty. Maybe they get halfway and decide they've come this far it must be close now. It's not, you're barely halfway. On and on they come, with their children. Holding towels and picnic baskets. There are bridges to cross. 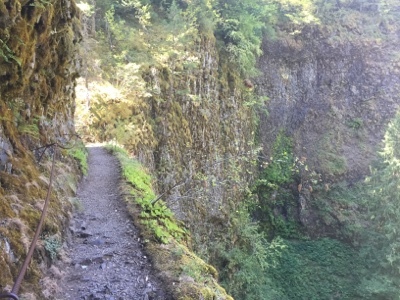 The trail is blasted into the sides of cliffs. There are views down into blue pools beneath white falls. The trail passes through a tunnel behind a rushing wall of water. It's amazing. The river is deep down below me passing through a vertical rock walled canyon. Other falls drop off the edges down to meet the river below. I am so overwhelmed with the views I forget the pain in my feet. This is worth the pain. I continue past more and more people until finally late in the afternoon I arrive at the trailhead. It's only about three miles from here to Cascade Locks. I refill my water bottle from a drinking fountain. What a great invention, water comes out when you turn the handle and you don't have to filter or purify it. Just drink! I am able to change my reservation at the motel. I have a room tonight. I have a shower too! I drop off some stuff in my room and head down to PCT Days. It's on Mariner’s Island. I wander through the vendors booths and I am able to get some repair tape and advice for repairing my pack and tent zipper from the ZPacks booth. I also meet Melissa the proprietor and chief chef of Backpacker’s Bistro. She's got samples! I try a few and she gives me a Thru-hiker multi-meal discount. I now have my dinners from here to Trout Lake. It's hot out and I've hiked a long way to get here. I am done and need a break. I head back to my room and explode my pack then take a shower. I sit in the cool sixty seven degree air of my room and literally chill out. Dinner time and I'm heading back down Wa Na Pa Street. Wa Na Pa is short for something like Walk Natural Pace, or not. Maybe it's a Native American phrase that means, “Good place for a bridge.” I don't really know, it's easy to say and spell in English though. I head to the Columbia Market to scope out my resupply options. As I pass the Cascade Locks Ale House I notice a banner that says, ‘PCT Hiker Pizza Party and Beer Tasting 5-8 PM’. I check my phone, the time is five thirty. Pizza sounds good for dinner. I stop in at the market and check their ice cream selection. Yay, pints of Dreyer's Butterfinger ice cream. Now I know what's for dessert. I run into Brunching Bill and tell him about the pizza party and beer tasting. I leave the market and head over to the party. They are making pizzas as fast as they can as a local micro brewery is providing tastes of four of their brews. I settle for the lightest ale, the Serendipity I think it's called. I grab a couple of slices of pizza and see Batdance and Rockbiter. I go sit with them and meet Cooper their dog who'll be accompanying them for the Washington section. I also meet their friends from home who've already been bequeathed with trail names, No Cheese, Leprechaun, and Well Done. Brunching Bill shows up and sits with us too. I look around and see a whole host of hikers I recognize from the trail and others who I haven't met yet. I finish my two slices of pizza and realize I'm going to need a lot more than that to fill me up. I go and order a whole pizza for myself. Then I go back and sit with my friends. Meeting and greeting others as they pass by. My pizza comes and I inhale it, the whole thing, no left overs. I still find it amazing that I can eat this much and not be stuffed. I hang out for another hour or so, until mosquitos show up and damper my enthusiasm for sitting outside. I say my goodbyes which is, “see you on the trail.” Probably true in most cases. Then I head over to the market and buy two pints of Butterfinger ice cream. I head back to my room and enjoy eating both of them before bed. It's been a long day and I fall asleep listening to the comforting sound of the air conditioning churning out volumes of cool air that wafts across my face better than the super heated air the forest has been producing for the last few days. Thank you so much for your vivid and honest play by play. I feel like I'm there too!